PHOENIX – Arizona Gov. 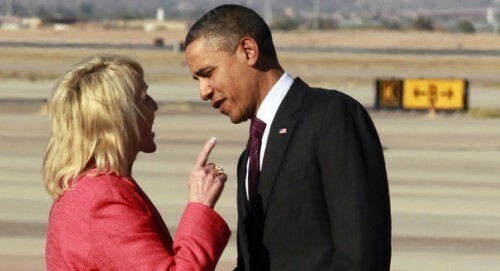 Jan Brewer has signed an executive order directing state agencies to deny driver’s licenses and other public benefits to young illegal immigrants who obtain work authorizations under a new Obama administration program. Brewer’s order issued Wednesday says she’s reaffirming the intent of current Arizona law denying taxpayer-funded public benefits and state identification to illegal immigrants. Young illegal immigrants could start applying Wednesday with the federal government for work permits under the Obama administration’s Deferred Action for Childhood Arrivals. The program defers deportations for young illegal immigrants if they meet certain criteria. Brewer’s order says the program’s federal paperwork doesn’t confer lawful status on illegal immigrants and won’t entitle them to Arizona public benefits. She directs state agencies to start emergency rulemaking processes as necessary to implement her order. This is the topic of an email being circulated under the title “Ann Coulter has guts”, that she does and she has attacked the problem head on. To restore our country to its rightful place, we must restore its racial balance, bringing in those that have the skills needed, regardless of nationality, race or religion, and preserve the jobs for our qualified citizens. Excerpt:While conservatives have been formulating carefully constructed arguments, liberals have been playing a long-term game to change the demographics of America to get an electorate more to their liking. Teddy Kennedy’s 1965 Immigration Act was expressly designed to change the ethnic composition of America to make it more like Nigeria, considered more susceptible to liberal demagogues. Since 1965, instead of taking immigrants that replicate the country’s existing ethnic mix, we’ve been admitting mostly immigrants from the Third World. At the same time, people from the countries that sent immigrants to this country for its first several centuries have been barred. The “browning of America” is not a natural process. It’s been artificially imposed by Democrats who are confident of their abilities to turn Third World immigrants into government patrons. It’s worked. According to the Center for Immigration Studies, 57 percent of all immigrant households in the U.S. get cash, Medicaid, housing or food benefits from the government — compared with 39 percent of native households. The highest rates are for immigrants from the Dominican Republic (82 percent), Mexico and Guatemala (tied at 75 percent). Isn’t the idea to get immigrants with special skills? If you can’t even get a job, by definition, you do not have a special skill. Other than voting Democrat. Read full Ann Coulter article here. 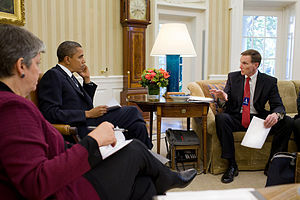 I would not bet that the 2012 election is simpler than we think, but, when you look at the accomplishments of the Obama administration, with his majorities in the House and Senate during his first two years, what he has done is show that he is an unrepentant ideologue with no love for capitalism or our Constitution. You know why they’re not using “You know me”? Because we know him, and it’s not a plus. There is a growing air of incompetence around Mr. Obama’s White House. It was seen again this week in Supreme Court arguments over the administration’s challenge to Arizona’s attempted crackdown on illegal immigration. As Greg Stohr of Bloomberg News wrote, the court seemed to be disagreeing with the administration’s understanding of federal power: “Solicitor General Donald Verrilli . . . met resistance across ideological lines. . . . Even Justice Sonia Sotomayor, the court’s only Hispanic and an Obama appointee, told Verrilli his argument is ‘not selling very well. '” This follows last month’s embarrassing showing over the constitutionality of parts of ObamaCare. All of this looks so bush league, so scattered. Add it to the General Services Administration, to Solyndra, to the other scandals, and you get a growing sense that no one’s in charge, that the administration is paying attention to politics but not day-to-day governance. The two most public cabinet members are Eric Holder at Justice and Janet Napolitano at Homeland Security. He is overseeing the administration’s Supreme Court cases. She is in charge of being unmoved by the daily stories of Transportation Security Administration incompetence and even cruelty at our airports. Those incidents and stories continue, but if you go to the Homeland Security website, there is no mention of them. It’s as if they don’t even exist. Maybe the 2012 election is simpler than we think. Read full WSJ article here.